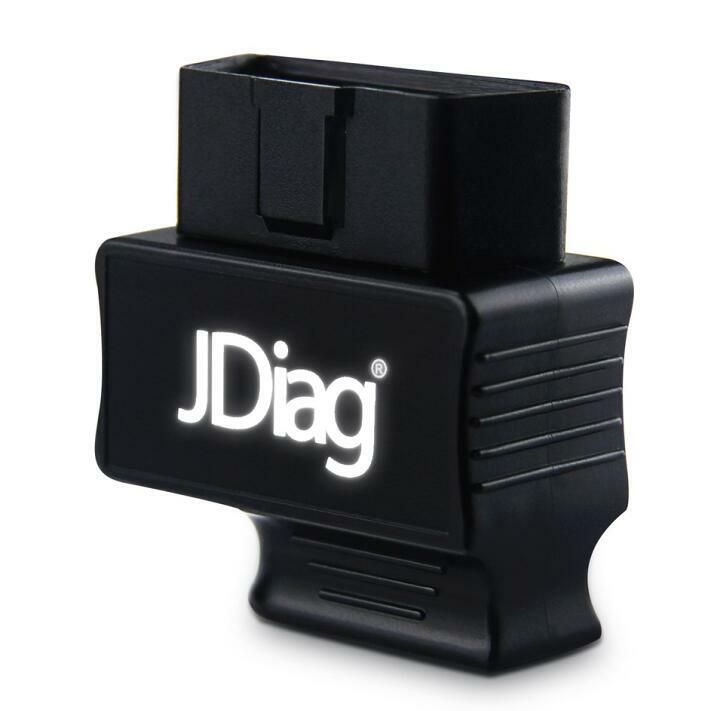 JDiag FasLink M2 Blue Driver is a Professional Diagnostic scan tool by providing professional data to users, which is also trusted by mechanics and developed by Professional Engineers. 1.The APP can not runs in windows or tablet. 2.This one can't support for Diesel or Trucks. 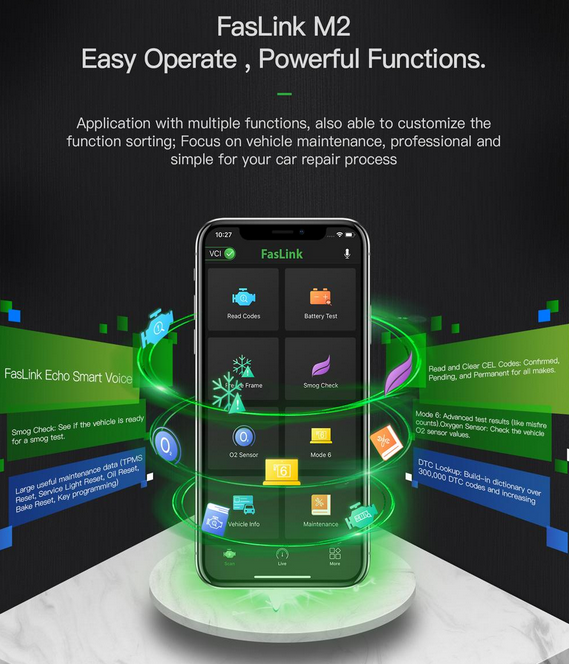 3.The FasLink application supports Bluetooth 4.0 BLE devices,please confirm which type bluetooth you choose before connection. 4.Please make sure the vehicle battery voltage stable and ignition on during testing, otherwise the data will be not correct. 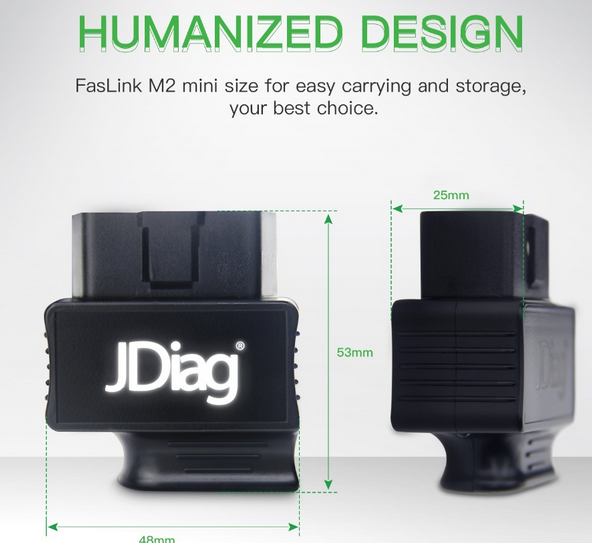 5.Please do not use the JDiag FasLink M2 device in humid or high temperature condition. 1. 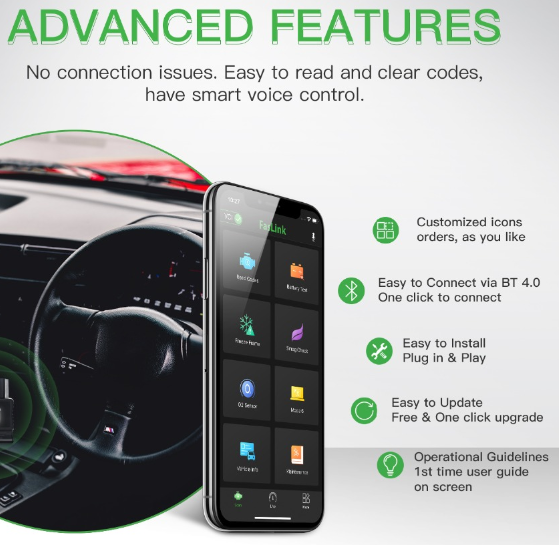 FasLink M2 is the 1st Smart Voice OBD2 Bluetooth Scanner in the world. Helps you talk to the mechanic or gives you detailed information on your error codes of possible caused reason. 5. FasLink M2 hardware with screw-less assembly, logo LED indicator, non-slip design shell with environmentally friendly solder paste material, industrial designs with smaller size to ensure healthy, safety, beauty and easy to carry. 6. Diverse data flow display interface, self-defined PID expression and color. Q1: Will the device detect if a code has been cleared recently? 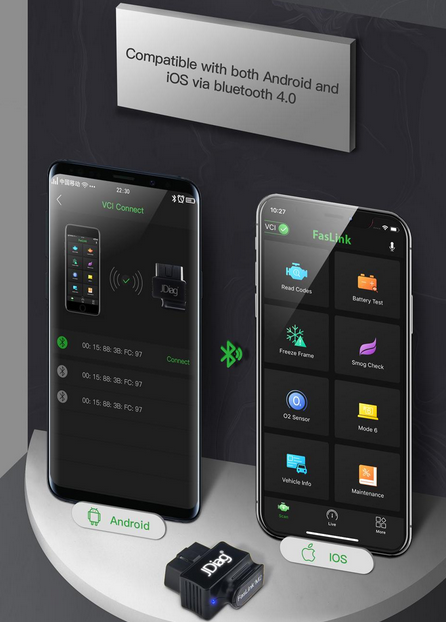 A1: Dear friend , the DTC will be completed cleared and not stored in ECU anymore, so none scanner can check the cleared DTC, FasLink M2 only able to check: Freezed code, stored code and current code. Q2: i purchased this and cannot get it to pair with my torque app. does it work with torque? A2: Hello! 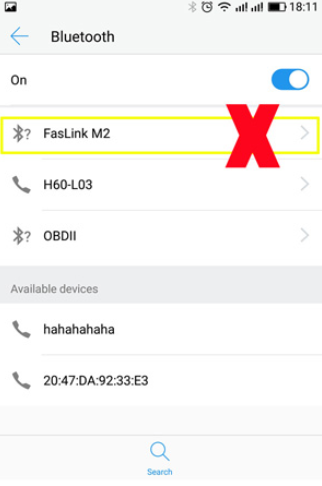 FasLink M2 is an original design (not elm based) and is not supported by other third party apps.Please use it by FasLink M2 App which is free . Q3: What car is support? a list of the cars please? 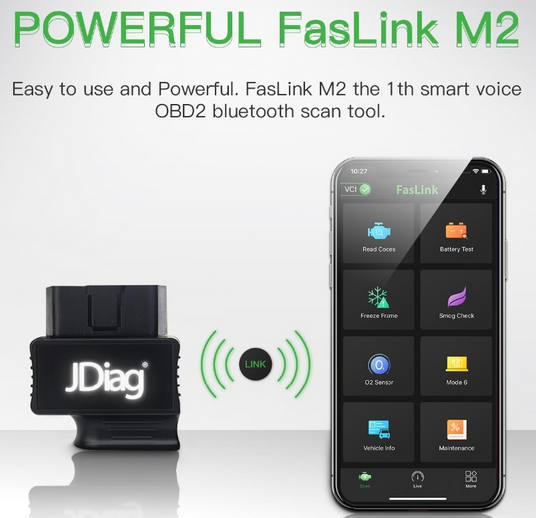 A3: I am sorry, we have no car list, the JDiag FasLink M2 works with MOST obd2 gasoline cars. Q4: work with diesel cars? Q5: If i want to make suggestions or leave feedback to JDiag company, how to do? 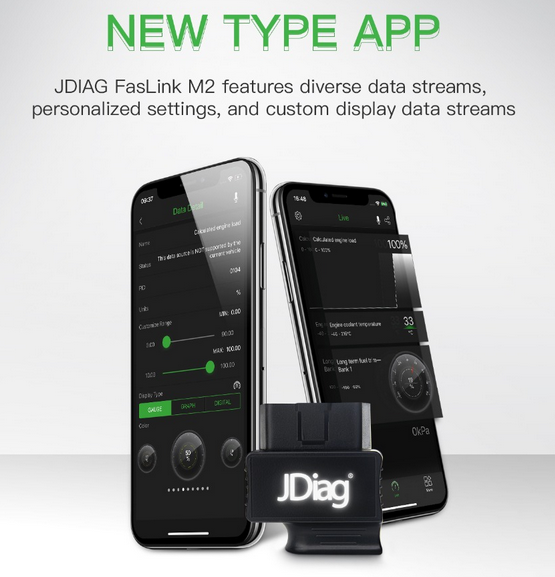 A5: The JDiag FasLink M2 App build-in feedback system, if you want to post review, please click "More", click "RATE & REVIEW" ; if you meet any problems or want to make suggestions, please click " More", click " Contact US" ; or please click "More" --"settings"--"Feedback" and then you can write message. Q6: It goes with user manual ? A6: The JDiag FasLink M2 App build-in video user manual, please click "More", click "User Manual", then you can see videos. Q7: How to update it? 2) Click "More", choose " Settings", and click "Update"
Q8: Need to pay extral for the software, like easydiag 3.0 ? 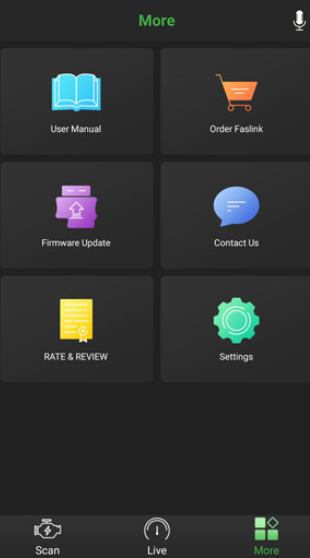 3) Scan the QR Code that on the back on FasLink M2 device. do this tool come with software ? 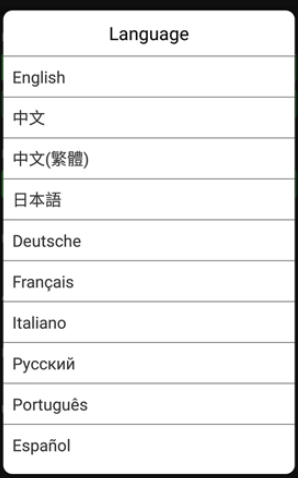 do this tool have spanish language ?